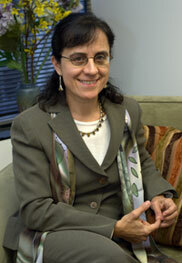 Ioanna K. Chaney, LCSW, CPCC, MBA is a psychotherapist and a certified life coach. She is skilled at motivating and empowering people to clarify and achieve their goals. Ioanna has extensive experience in cognitive behavioral therapy, family systems and client-centered therapies, as well as life and executive coaching. Ioanna specializes in issues of transition, such as critical times in a person’s life that create feelings of unease, confusion and distress. These include career transitions, parenthood, relationship conflicts, separation and divorce, empty nesting, mid-life crisis, grief and loss, accidents, and retirement. Ioanna helps clients gain insight into their situation and feelings. She also motivates and empowers them to take steps leading to the emotional, attitudinal and behavioral changes they wish to make. Ioanna has worked with a diverse client base, including adolescents, young adults, families, couples, and individuals in transition, on a variety of emotional, psychosocial, and professional issues. Certification in Client-Centered Therapy, Chicago Counseling & Psychotherapy Research Center. Successful business owner with 20 years of management experience. Seminar leader and public speaker. Trained in personal financial needs assessment. Member, UCWBG (University of Chicago Women's Business Group) where she served as VP of Professional and Personal Development for two years.